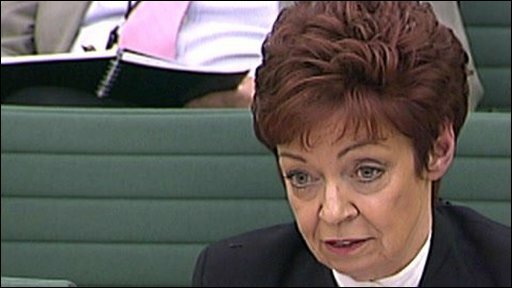 Senior Commons official Jill Pay has said she "deeply regrets" events leading up to her allowing police to search an MP's office in Parliament. The Serjeant at Arms has been criticised for failing to ask police for a warrant to search Damien Green's office in November 2008. She said she was put under "considerable pressure" by police and not told she could refuse the request. Mr Green was arrested in 2008 in a leaks inquiry but was not charged. The police action was later ruled to have been "not proportionate". At the time, MPs were furious police officers had been allowed into the Commons to conduct a search without a warrant. Lord Martin, Commons Speaker at the time, has said he assumed that police did have a warrant at the time and that Mrs Pay felt she was "bamboozled" by a senior police officer over the case. On the morning of Mr Green's arrest, Mrs Pay said she told the Speaker that police were set to arrest the shadow immigration minister, what he was accused of and that they wanted to search his Commons office. However, she told a committee of MPs looking into the affair that she did not seek his consent as she believed she had the authority to approve the controversial search. She said the police had told her that she could grant "lawful consent" for the search and that this could replace the need for a warrant. She said she had never been told she could refuse the police's request or insist on a warrant. She added that she felt "under considerable pressure" as she had been convinced by the police in her discussions with them that she could be "obstructing" a serious criminal investigation if she objected. The police told her that the MP could face a prison sentence of 25 years if found guilty of the offences cited, she said. She said she received approval from her boss Malcolm Jack, the Commons Clerk and chief executive, to grant consent but was told she would need the Speaker's approval if an MP's office was to be searched. She acknowledged an "error of judgement" in not discussing the matter earlier with colleagues when first informed of the police's intentions and for accepting the duty of confidentiality placed on her by the police not to discuss the matter widely. She also apologised for any "anxiety or distress" caused to MPs about the impact of the affair on the sovereignty of Parliament. The cross-party committee headed by former Lib Dem leader Sir Menzies Campbell is looking at how Commons authorities should in future deal with requests for police searches. Appearing before the same committee in November, Lord Martin said he had been "let down" by his colleague who he said had failed to require a warrant for the search and had known about the police investigation for a week before Mr Green's office was searched. Another official had blamed police tactics for the Serjeant at Arms not alerting her superiors, he told MPs. When he asked her to explain her conduct, he said Mr Jack had stepped in to say the officer in charge of Commons security had "bamboozled the Serjeant and tricked her into keeping the matter from her immediate superiors". The Metropolitan Police has rejected suggestions that its officer acted in such a way. Earlier former Clerk of the Commons, Sir William Mackay, told the committee the "buck should stop" with the Speaker over such an incident and his permission should have been sought for the request.